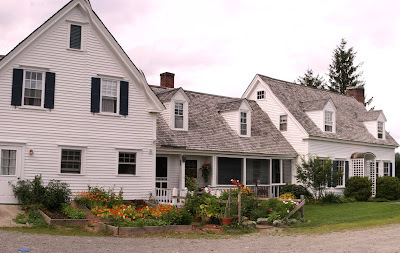 This is Mountain Village Farm Inn Bed and Breakfast in Kingfield, Maine, the gateway to SKI Sugarloaf. A wonderful, fully renovated 1850's farmhouse/cape on 7 rolling acres, separate "Gallery" building and huge L-shaped barn in very good shape with no evidence of sagging ridges. There are 6 guest rooms with private baths, a living room with fireplace, a large cafe/great room with picture windows that's open to the spacious kitchen. New 8 zone heating system, energy star replacement windows, newly enclosed front porch, various garden beds and other wonderful details. Currently the inn raises chickens offering guests fresh eggs used for breakfast. At times there are several pigs and other farm animals, making for a very unique B&B experience. There's also an option to purchase an additional 10 acres of land (the entire parcel is 17 acres) for an additional $75k. This is a fabulous turn key property with a good business in place for buyers to continue to grow.